One evening a couple weeks ago, I was driving home and listening to the classical radio station. Amidst the chatter of my boys, my attention was captured by a piece I'd never heard before. The melody was haunting and melancholy. It was performed on a muted trumpet, which gave it more of a reed-like timbre, almost like an oboe. It sounded somewhat contemporary with a bit of a jazz edge. "This is beautiful," I told the boys, and for just a moment, they stopped to listen, too. I pulled up to our house, hurried to unbuckle the boys, and then rushed inside, all the time repeating the key facts I knew: Oblivion. Astor. Tine. Oblivion. Astor. Tine. 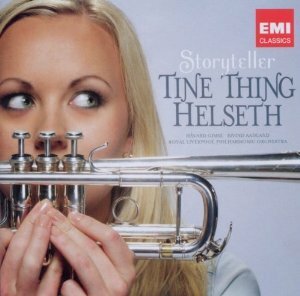 The trumpet soloist's name is Tine Thing Helseth. (The composer's name is Ástor Piazzolla.) This piece was not originally written for the trumpet. I think it was an orchestral work first for maybe solo cello. Or possibly oboe. The other versions I heard were slower with less jazz. I spent the rest of the evening listening to any other videos of Tine Thing Helseth I could find. I hate to sound immediately disloyal to "Oblivion," but when I heard her play "In the Bleak Midwinter," I couldn't help but love it even more. I have always loved that song, and for some reason, probably because I am in the "bleak midwinter" right now, it spoke to my soul. Gorgeous. And then, what do you think? Of course I checked out her most recent CD from the library. To think that a month ago, I'd never even heard of Helseth, and now I can't stop talking about her. It makes me excited to see what other discoveries are just around the corner. My husband discovered her recently, too! How funny. He listens to her a lot on YouTube. I just love your blog! I'm setting one up of my own, but it's slow going because I have to stuff it between work and school. Thank you, Amy, for finding this artist. I am going to explore iTunes for some of her recordings. I agree about In the Bleak Midwinter! Grandma Jones - I hope you enjoy what you find. I believe she has a new album coming out next month, too. Pretty! I love how jazzy and understated it is. And it made me miss Norway even more (I visited the country more than eight years ago). Though it sounds weird, jazz is a big thing over there and I actually heard a few of the best jazz bands just playing for a few bucks on the sidewalk here and there! Thanks for sharing this artist! Oh my! She is amazing! Amy - I actually tried to find the schedule on their website (not for this piece but for a different one) and couldn't. I'm sure it was right in front of me. I'll have to look again.